What water storage tank is best for a remote home? Question: I need more info about drinking water storage tanks for remote health posts and homes. The capacity I am looking for is 1,000 to 10,000 gallons. If there should be a defect, where do I have to return for repair? Answer: Thank you for contacting us! 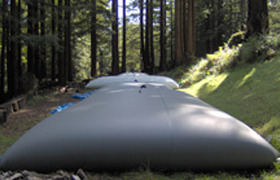 The flexible tanks can be an excellent choice for water storage in remote locations due to their flexible, folding exteriors and low cost transportation requirements. Tanks are available in almost any size from 25 to 210,000 gallons. We have a reliable tank repair kit that can be added for minimal cost, so if there are any tears or abrasions, they can be fixed on-site. Lead times will tend to vary depending on the amount of tanks required, sizing, and demands. If you are looking for something by a certain time frame, please let us know and we will work to see if this pricing and time line is available. Construction for all of our tanks include robust top grade materials that help to equip the tank for outdoor storage, demanding liquids, or other requirements. When used for drinking water, interiors of the tank will be built with an inner fabric that is FDA and NSF 61 approved for safe drinking water storage. Warranties will typically include 1 year workmanship. More information on this can be found in our Water Tank Policies page. Hopefully this helps provide you with some additional information regarding the construction and storage of these tanks. If you require any other information regarding Water Storage Tanks for Remote Homes, please contact us and we will discuss your requirements further.